Mobile phone use is continuing to reduce the amount of time people spend using landlines, according to a report by the UK communications watchdog. For the first time, calls from mobiles now account for more than a third of time spent on phone calls, Ofcom said. Mobile phone call minutes totalled 82 billion last year, in an overall total of 234 billion. 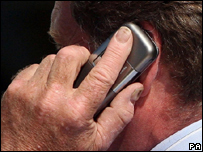 And 9% of UK households rely solely on mobile phones, compared with 7% that only have a landline, the report added. "There are more households which are now mobile-only in terms of their phone. The first quarter of 2007 is the first time that has happened," said Ofcom spokesman Peter Phillips. Subscriptions to fixed telephone lines continued their decline, down 1.5% to 33.6 million last year. Meanwhile demand for gadgets such as Blackberrys and other PDAs - as well as users being lured to a new network by competitive tariffs - increased mobile phone subscriptions. Ofcom's report also showed a slight growth in the number of children using mobiles, with 53% of eight-to-15-year-olds using a handset in 2006 compared with 50% a year earlier. Ofcom also said that the average cost of all telecoms - including landlines, mobiles, texts and broadband - fell to £69.85 per month for residential customers in 2006, from £76.36 the previous year.